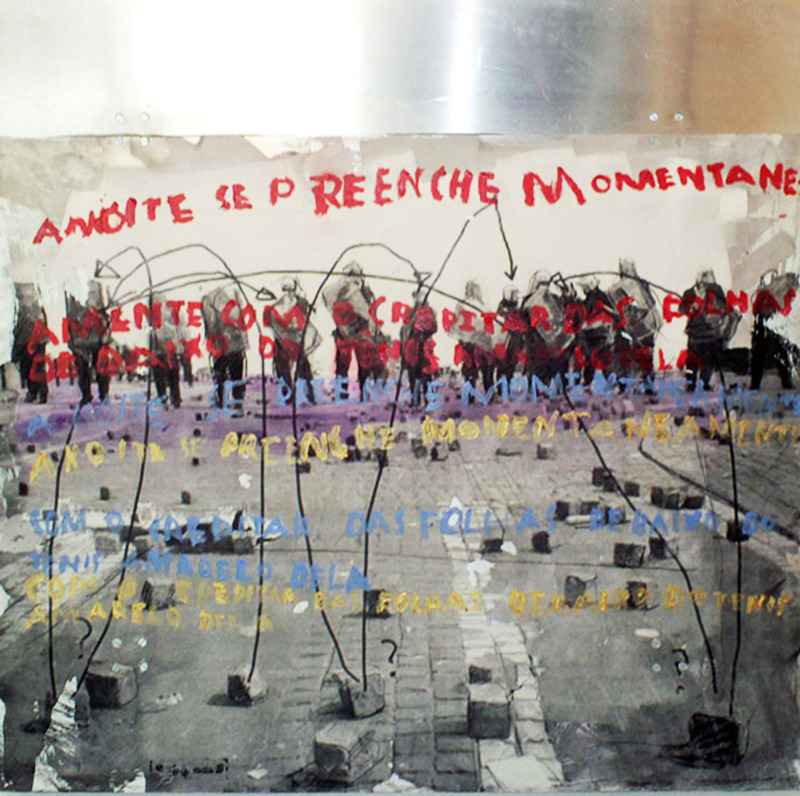 My exhibition at Maria Teresa Vieira Art Center in Rio de Janeiro in 2009 began with the thoughts about civil resistance, political violence, and determinism. Right or wrong and the possibility of influencing the course of events or not. During the time I was working on the show, I found more and more inputs and underlying meanings in my works. At the same time, I felt fixed to work free of the original incentives. In half of the process, I found myself forced to rename the entire exhibition to ”inútil” (without use). ”The night was momentarily filled with the crackling of leaves under her yellow sneakers” 2008, mixed media on aluminum 100 cm x 100 cm. ”How is it that every time a car passes by with the fan belt spinning, I get a feeling that there is a grenade at the entrance of the roof terrace”. 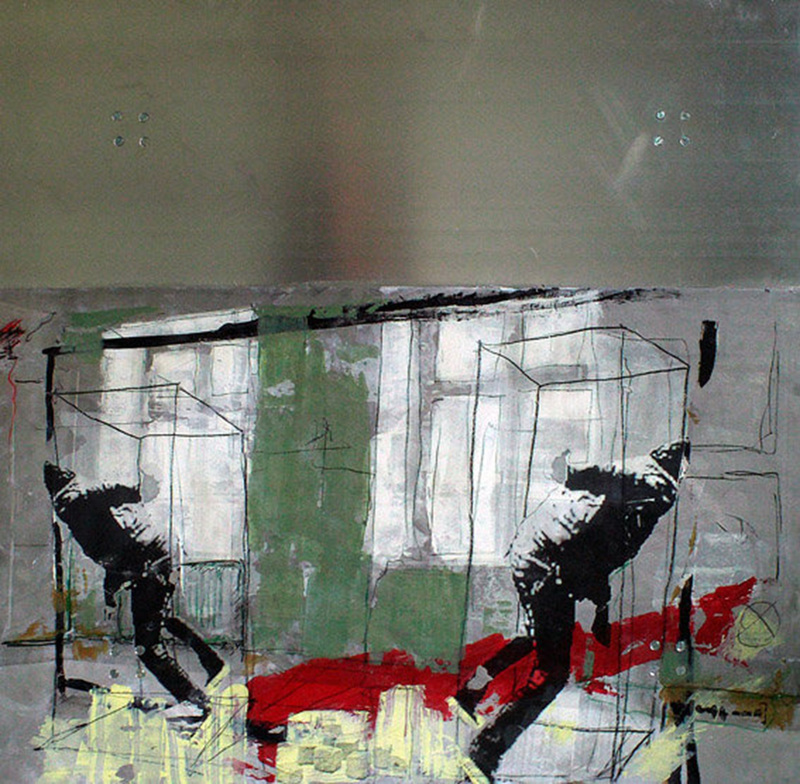 2008 mixed media on aluminum 100 cm x100 cm. 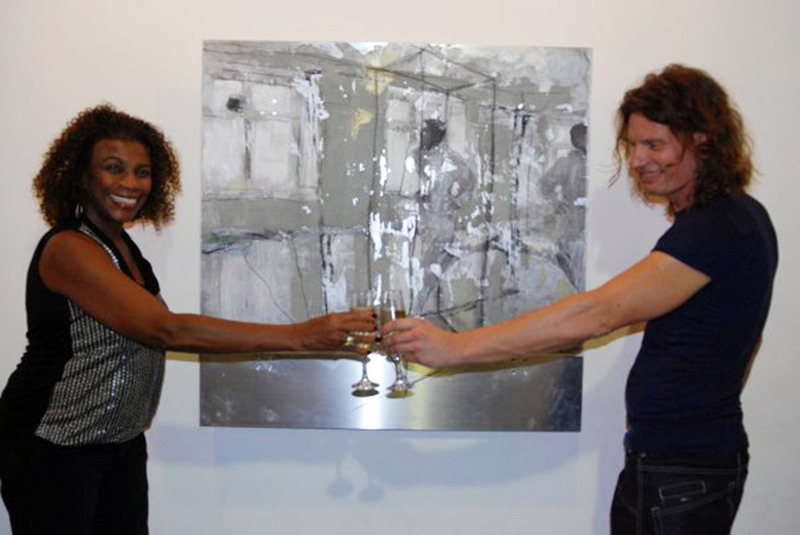 Zeze Motta and I at the opening of my show ”Inutil” at the Maria Teresa Vieira art center, Rio de Janeiro, Brazil. 2006 ”FLOWER OF EVIL …OR JUST AN EXTRAJUDICIAL EXECUTION” Ad Hoc Gallery, Stockholm, Sweden. After the exhibition “Parts and Pieces” in 2003 I was without ideas what I wanted to do next. I did work in my studio ended up produce nothing even if I was working more then ever. 2005 I was leading a group of artist in the ”Art Park Project”. This was the second time. I had done a similar project for the first time in 2003. It was a success even if I wasn’t satisfied with my part of the exhibition. I was looking for a way to leave my old storytelling pictures/paintings and I wanted to do something that was more direct. ”Evil flowers…I” 2006, bullet holes in painted aluminum. 2 x 50 cm x 50 cm. 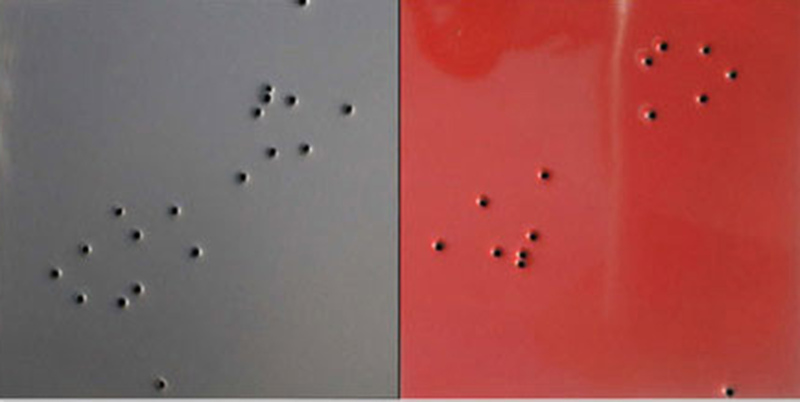 2004 ”PARTS AND PIECES” Ad Hoc Gallery, Stockholm, Sweden. When I came back from Moscow I had met Alexander Pankin and he had showed me his mathematical work on the aesthetic of Kazimir Malevitj. Yes, he tried to find an objective formula on the aesthetic of Malevitj. Naturally it was a stillborn idea but his exhibition had some real interesting angles. It was like a bridge from modernism to postmodernism and he had found a very sterile aesthetic with its geometrical forms and figures. Three years later I was working with an exhibition named “Parts and pieces” where I was incorporating Malevitj work with Pankins mathematical figures into my work. I did imagine the square forms of Malevitj in a three-dimensional way. (This is a very easy thing to do.) Then I did put the cubes and other bulky forms in empty rooms. 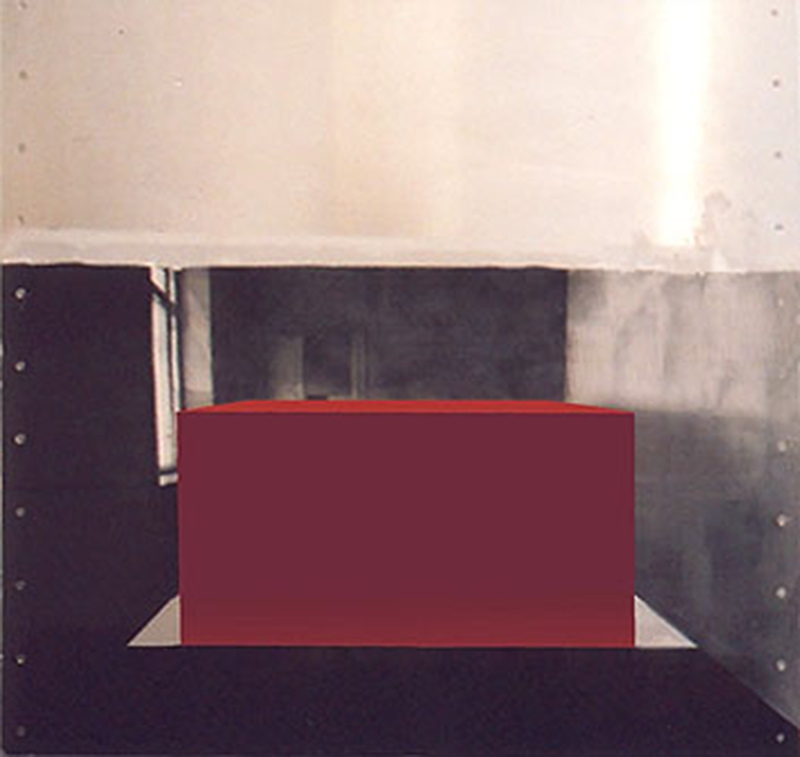 ”Red cube in a white room” 2004, mixed media on aluminum 100 cm x 100 cm. 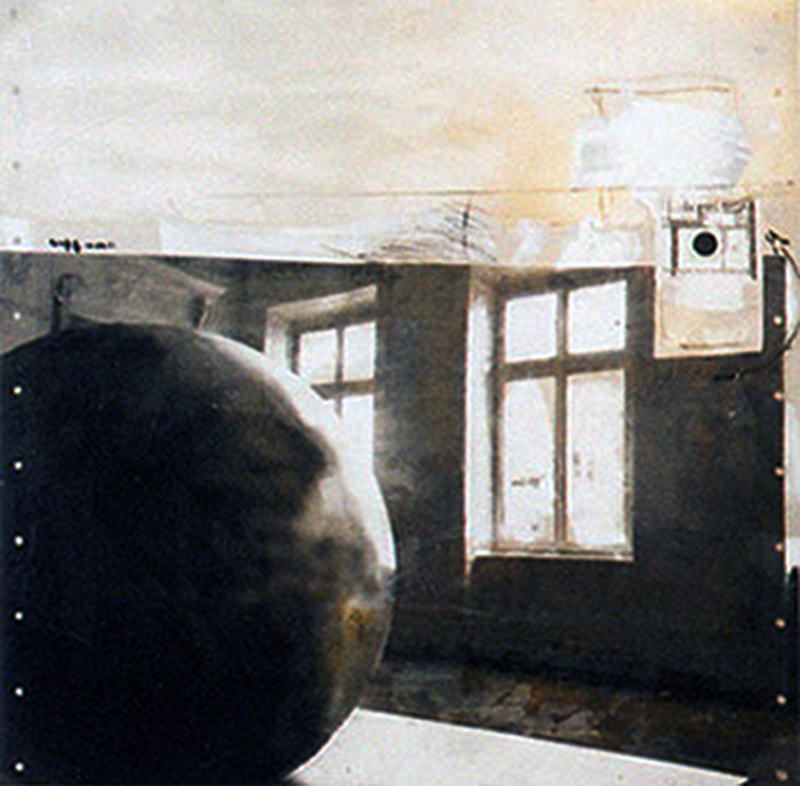 ”Black globe in a white area” 2003, mixed media on aluminum. 100 cm x 100 cm. 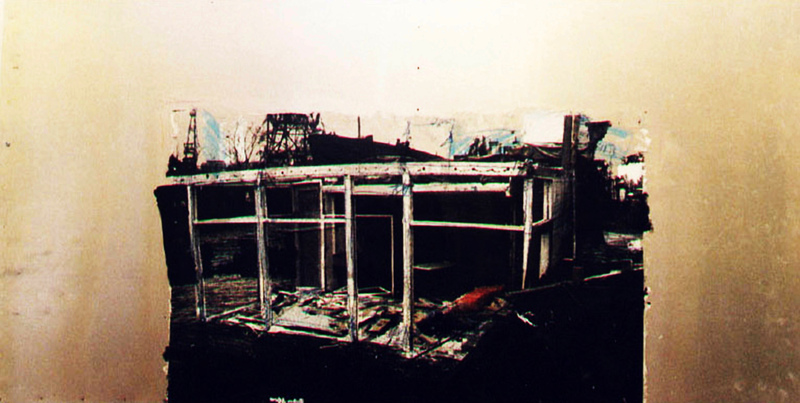 Detail from ”Walking right throw the final destination again” 2000, mixed media on aluminum 100 cm x 100 cm. Detail from ”To get too close” mixed media on aluminum, 100 cm x 100 cm. 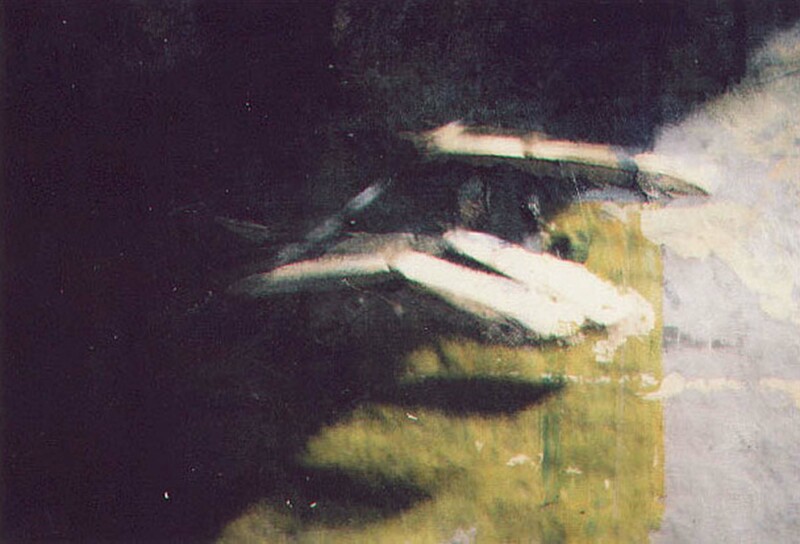 In 1999 I had my first art show in Moscow. When I got the invitation two years earlier that I was welcome to have an exposition in the art hall, Gallery A3, in Moscow I was very excited over the possibility to show my work for a big audience. At the same time, I was worried because I had started to use a new technique. The year before I had a big exhibition in the Culture house of Stockholm with an extremely good photographer named Kia Naddermier. We had been working together with the exhibition, where we tried to get abstract painting and photography to work together. I was painting on a naked model and Kia was using the camera, documenting the wet paint on the skin. At first, we didn’t know how to present the work. 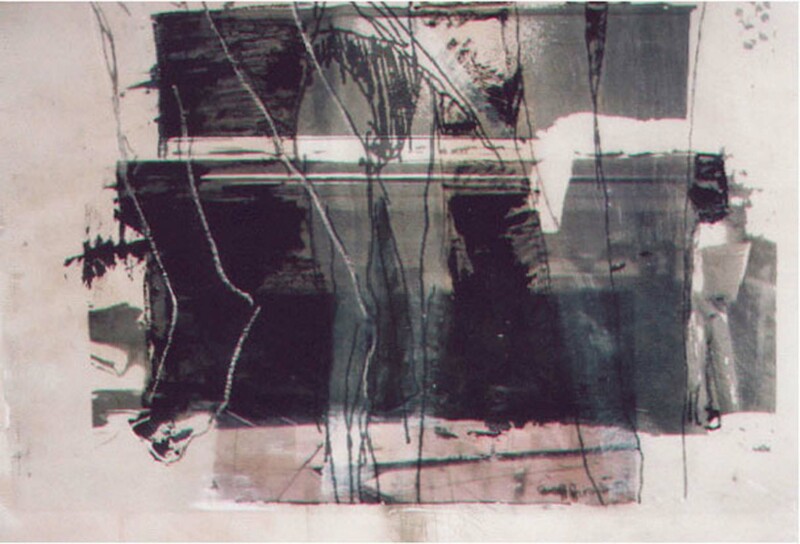 We didn’t want anything that was associated with photo nor with paintings so we developed a technique, a monotype on aluminum, to present our work. The problem was that the art hall in Moscow had only seen my abstract work and not my recently figurative work that was based on photos. I hadn’t given up the abstract painting but I was moving away from it. When I finally decided to take it apart and make an art project from the documentation from the dismantling, I was relieved. It was art by necessity. It wasn’t a decision of mine anymore, it was a fact and I didn’t have to have any intellectual doubts. There was a pregnant silence. 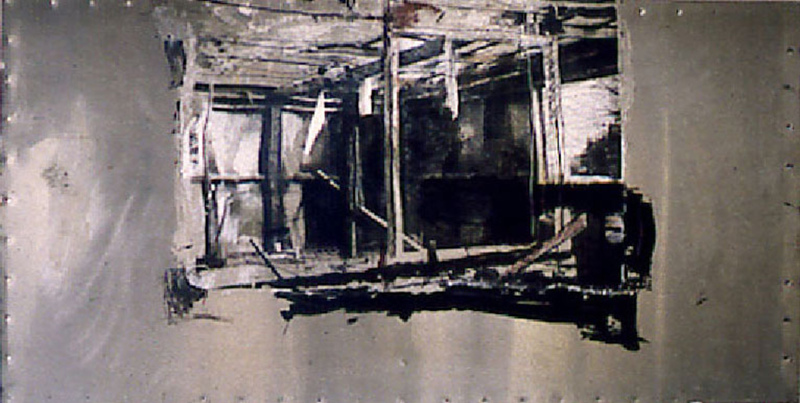 ”m/s Bella, the last view”1999, mixed media on aluminum, 200 cm x 100 cm. 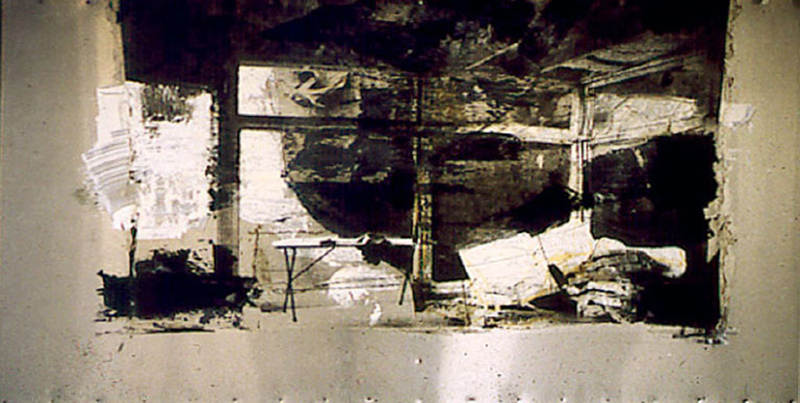 ”White flag”1999, mixed media on aluminum, 200 cm x 100 cm.